My parents came to spend the day with us on Christmas Eve and take me grocery shopping for the holiday meals. I was pretty exhausted from a night of very little sleep between the boys’ antics, but managed to scrape together a menu and a shopping list. My parents headed back home rather early in the day and didn’t stay for dinner on Christmas Eve; Nolan spent the night at their house and got to preview two of his Christmas presents, a lycra swing and a homemade crash pad. To keep things simple for our Christmas Eve dinner, I put in an easy pork loin recipe to braise, one of my all-time favorites with just 3 real ingredients. I served it simply with mashed sweet potatoes flavored with rehydrated porcini mushrooms. While it cooked, I finished off a few of my homemade Christmas presents: beard oil for Jeremy, a foot soak mixture for my mom, and some salve for my dad. Theo also helped me bake some chocolate wafer cookies to make into faux-Oreo sandwich cookies, mostly for my dad’s benefit, as he has been missing Oreos. I really wanted to make everyone a special Christmas breakfast this year, so I talked my parents into coming over early and bringing their ebelskiver pan. 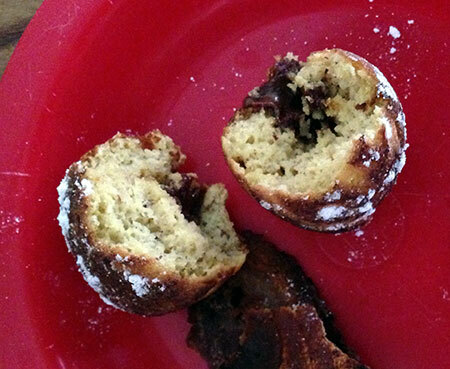 I have made ebelskivers with my dad a few times before, but that was before we transitioned to gluten-free. I was determined to try my hand at a grain-free version, but I had concerns about ending up with undercooked centers. My last-minute adaptation used coconut, almond and hazelnut flours and half a dozen eggs. I was able to get them cooking just fine with an extra half-turn, and was even able to stuff them with a few different fillings: chocolate-hazelnut spread, cinnamon-almond butter, and strawberry-chia jam. We served them with a sprinkle of powdered sugar (for my mom), fresh whipped cream and more strawberry-chia jam on the side. I only wish I had thought to buy some sausages to go with them, but live and learn! Mix together all ingredients while heating your ebelskiver pan over medium heat. Put a dot of coconut oil in each well of the pan when it is hot, and fill each well with about 2 T of batter; I use a 2T disher, which worked perfectly. Cook ebelskivers on the first side until golden brown underneath. Use a toothpick, skewer or official ebelskiver turner to rotate them 90 degrees; the batter on top will still be wet and drip down to the base of the well, which is what you want. Fill with a teaspoon of desired filling (jam, sautéed fruit, nut butters, cream cheese, etc. ), then carefully rotate an additional 90 degrees, which should cover the filling with batter and start cook any remaining raw batter from the top. You will end up with a little globe-shaped pancake that is cooked through. Repeat with all wells and all additional batter. Source: Very loosely based on Simply Living Healthy. After breakfast, we opened presents, and Theo spent the rest of the day vacuuming the entire house with his toy Dyson. I launched right into cooking the dinner meal because my parents were concerned about the threat of snow and wanted to get on the road before it got too dark out. 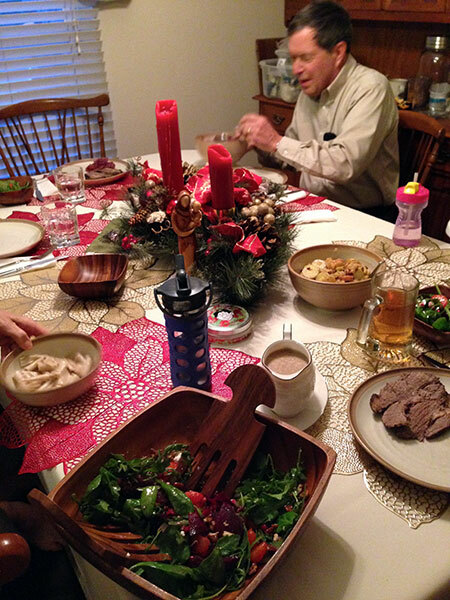 The theme for Christmas dinner was German-inspired and sour. I braised a 5-pound chuck roast for sauerbraten, using a very abbreviated marinade and braising time to step up the time table for dinner. 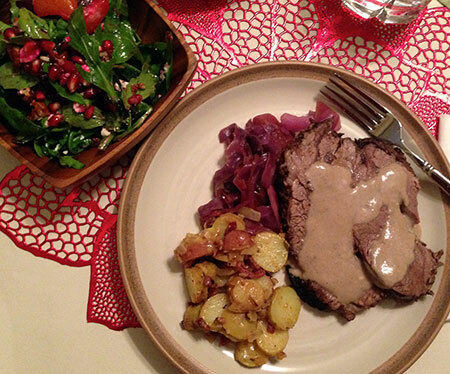 It was served with an exceptionally easy gravy, just the juices from the marinade/braising liquid, the onion that cooked with it, and a dollop of sour cream, all pureed in the blender and naturally thick enough without any further ado. For the sides, red cabbage seemed to be an obvious choice, so I braised a big pile of that with butternut squash, apple, and onion, based on a recipe from Molly Stevens that flavors it with maple and ginger. My mom is a fan of warm German potato salad, so I also made a big bowl of that using fingerling potatoes and duck bacon (as she is preferentially avoiding pork these days). And finally, for some fresh greens, I tossed together a salad with festive colors and flavors: baby spinach and arugula with pomegranate arils, roasted red beets, candied pecans, satsuma orange segments, and goat cheese, with a simple vinaigrette of honey vinegar. I had intended to make a gingerbread cake for our dessert but never found the time to bake it. Instead, we nibbled on a trio of chocolate: no-bake grain-free chocolate peanut butter bars, dried fruit dipped in dark chocolate, and grain-free fauxreos (chocolate sandwich cookies with vanilla buttercream). My Christmas gifts to you: recipes for the well-received body care products I made for my family this year. Full of ingredients to moisturize dry skin, nourish and soften the bear, promote hair growth, and stabilize the mood. Stir everything together and place in a 2oz tinted dropper bottle. Can apply just a few drops neat daily, or use a bit more oil and cover the face with a steaming hot washcloth as an oil cleanser and conditioner. Blend oatmeal with baking soda and herbs to make a fine powder; stir together with remaining powders, and add essential oils. Makes 2 cups to fit in a pint jar. Directions for use: Fill a basin with water as hot as you can tolerate, dissolve 1 cup of foot soak mixture and add 1 C apple cider vinegar if desired. Soak your feet and relax until the water cools.